Giant can be a relative term. The Giant African Land Snail is definitely a giant among land snails, even if it is only a few inches long. It also manages to be one of the world’s worst invasive species, but it is it a giant problem on St. Martin? This snail has been quick to colonize the tropics. What’s the big deal about this giant snail? Originally from Africa, it has been spread by humans throughout much of the world’s tropics. Once it becomes established, it can transform its new home in a variety of ways, endangering local ecosystems, agriculture and even human health. The Giant African Land Snail is hermaphroditic, so every one is able to lay eggs. They do so 100-400 eggs at a time, up to 1200 eggs per year. Once they are introduced, they are quick to take over. Getting rid of them is hard. In Florida, an infestation was eradicated in the early 1970s. The effort involved killing 18,000 snails and cost over $4 million in today’s dollars. These snails are known to eat over 500 different kinds of plants, including many agricultural crops. They eat leaves, fruits and roots, scraping away at them with 80,000 tiny teeth on their file-like radula. They can also transmit diseases to plants, including diseases impacting cocoa, tangerines and eggplants. In some parts of the world, these snails are also responsible for spreading certain diseases, including some caused by nematode worms that live in the snails. Luckily, humans usually catch these diseases by eating raw or undercooked Giant African Land Snails, something that most of us will have no problem avoiding. 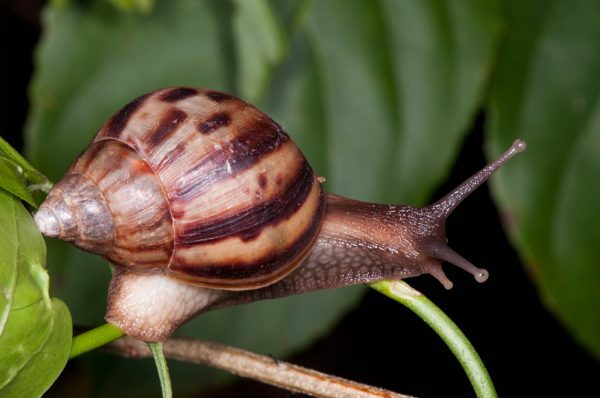 In the Caribbean, this snail was first found in Guadeloupe in 1984. By some accounts, it arrived in St. Martin along with supplies imported when the island was rebuilding after hurricane Luis. 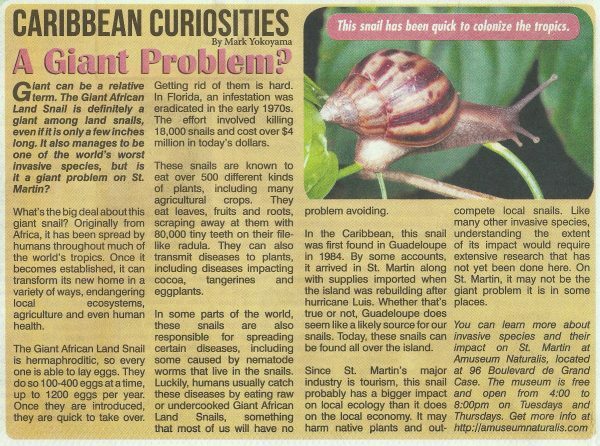 Whether that’s true or not, Guadeloupe does seem like a likely source for our snails. Today, these snails can be found all over the island. Since St. Martin’s major industry is tourism, this snail probably has a bigger impact on local ecology than it does on the local economy. It may harm native plants and outcompete local snails. Like many other invasive species, understanding the extent of its impact would require extensive research that has not yet been done here. On St. Martin, it may not be the giant problem it is in some places. You can learn more about invasive species and their impact on St. Martin at Amuseum Naturalis, located at 96 Boulevard de Grand Case. The museum is free and open 4-8pm on Tuesdays and Thursdays. Get more info at http://amuseumnaturalis.com.